Aboriginal spirituality can adapt to include elements of other religions and even everyday objects. The spirit "Biami" is younger than many think. Aboriginal spirituality can not only be changed by other religions, for example Christianity, but also by the environment Aboriginal people live in. Can a Toyota become part of the Dreaming? "Toyota", because four-wheel drive vehicles altered ways of life and contact with places and other groups. One of the more comprehensive new Dreamings is the Gurirr Gurirr Ceremony. In 1974, in the East Kimberley region of Western Australia, a woman died in a car accident near Warmun (Turkey Creek). People believed that torrential rains released by the Rainbow Serpent had caused the little creek close to the community to swell, causing the accident. 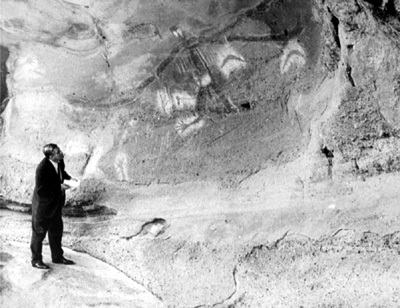 The woman's spirit came to Rover Thomas, a well-known Aboriginal painter, in a series of dreams in which she named the places and showed him the country that her spirit crossed after her death. She also showed him a series of images, songs and dances that became the corroboree known as Gurirr Gurirr which now belongs to the Gija people of Warmun and is celebrated regularly as part of their traditional culture . The Warmun art movement evolved from the painted boards used in the Gija people’s Gurirr Gurirr ceremony that depict aspects of the dead woman’s stories. According to Aboriginal writer Mudrooroo, Biami (or Byamee, Biame, Baiaimie, Baiame, Baayami, Baayama) is an Aboriginal 'all-father deity' which found its way into Aboriginal spirituality as a response to Christianity . Biami has a continuous presence in Aboriginal writings from the eastern states of Australia, because that was where Aboriginal people learned about Christianity. "The story of Biami is a special one. Biami is a God to my people, in the beginning he stepped down from the sky and created the land, formed the mountains and valleys, filled rivers with water, and created all living things. Everything Biami creator [sic] was wonderful! Plants of all shapes and sizes were placed on the land. He also placed men and women on special place he had created. Biami stayed and made sure all things that he created lived together in harmony. When he was satisfied he stepped back into the sky from which he came, where he remains now watching over his people and the wonderful place he created." "Aunty Eileen, a Bundjalung elder from northern NSW, was approached by a man who was being haunted by a spirit every night." How would you expect this story to continue? If we fancied a romantic view of Aboriginal spirituality (which is still promoted a lot in advertising) we would expect Aunty Eileen to chose some mythical method, to perform a ceremony or sing the spirit away. None of this happened in this real-world story . Aunty Eileen simply told the man to put a Bible under his pillow and read a verse from it should the spirit return the next night. 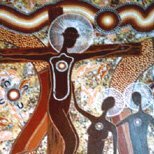 The Crucifixion, an Aboriginal spiritual painting by Richard Campbell. The Catholic World Youth Day 2008 in Sydney provided another example of how traditional Aboriginal art and spirituality join modern-day spiritual beliefs. Aboriginal artist Richard Campbell, a member of the Stolen Generations, created a series of Indigenous artworks which were used on official merchandise for the World Youth Day. The artworks reinterpret major Catholic themes and stories from within Aboriginal spirituality, and his works Fourteen Stations of the Cross, The Madonna, The Crucifixion and The Resurrection, were used on merchandise for the 225,000 pilgrims .